This time is a time of grace for you. You can never thank God enough for His grace. The time is for deepening your faith, and for your conversion. When the sign comes, it will be too late for many. Pray, pray, pray! Do not be discouraged. Be in peace because God gives you the grace to defeat satan. All of you together go to the meadow at Gumno. A great battle is about to take place. A battle between my Son and satan. Human souls are at stake.The visionaries, accompanied by about 40 local people, went to the prairie of Gumno, about 200 yards from Vicka's house. After many people had touched her, a black stain appeared on her dress. Marija cried. Marinko invited the people who were present to go to Confession. Excuse me for this, but you must realize that Satan exists. One day he appeared before the throne of God and asked permission to submit the Church to a period of trial. God gave him permission to try the Church for one century. This century is under the power of the devil; but when the secrets confided to you come to pass, his power will be destroyed. Even now he is beginning to lose his power and has become aggressive. He is destroying marriages, creating divisions among priests and is responsible for obsessions and murder. You must protect yourselves against these things through fasting and prayer, especially community prayer. Carry blessed objects with you. Put them in your house, and restore the use of holy water. According to certain Catholic experts who have studied these apparitions, this message of Mirjana may shed light on the vision Pope Leo XIII had. According to them, it was after having had an apocalyptic vision of the future of the Church that Leo XIII introduced the prayer to Saint Michael, which priests used to recite after Mass up to the time of the Second Vatican Council. These experts say that the century of trials foreseen by Leo XIII is about to end. Since the apparitions began in 1981, approximately 40 million people of all faiths, from all over the world, have visited Medjugorje and have left spiritually strengthened and renewed. Many bring back stories of miracles in the form of healings (of mind, body and spirit), supernatural visual signs, and deep conversions back to God. 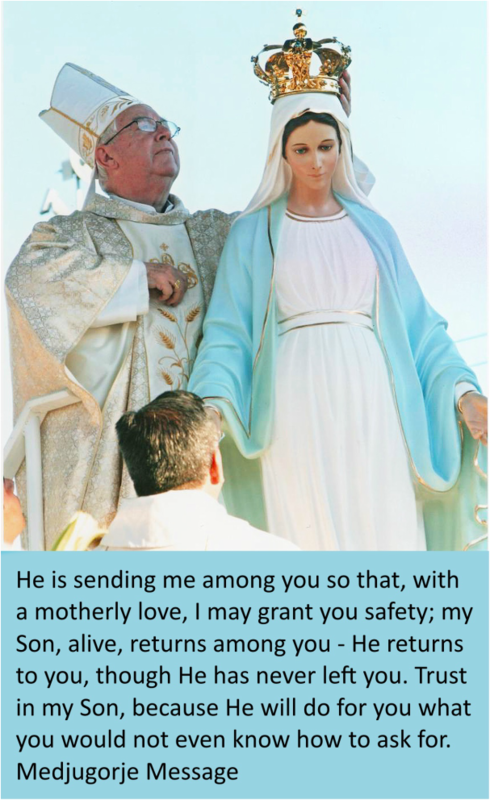 You owe it to yourself and your loved ones, to investigate with an open mind and heart the messages which are given to us by Our Lady of Medjugorje. I invite you to read these messages and decide for yourself how they will affect your life and that of your family.